Now, while working on the additional material that keeps showing up, I also found my way to some ULTRA Material (to be precise: DEFE 3 Data) on the website of the National Archives. I don’t know why I did not notice them earlier, but maybe I was just using the wrong search terms. My use of the term “ULTRA” in the previous statement is not quite precise as I was using it as a reference to general wartime signal intelligence data collected, deciphered and analyzed by the British intelligence units at Bletchley Park. ULTRA itself is not more or less than a security level – “top secret” was the highest ranking level at the time, “top secret – ultra” is above it and merely indicates the sensitive nature of this data (or more precisely of the British ability to decipher the material). Would the Germans have known that the British were able to read their intercepted messaged, they would have changed their way of coding them, taking away the ability of the British to read and act upon that information in almost “real-time”. DEFE 3, on the other hand, is a series of processed and filtered information compiled from the HW5 “raw data”. Again, each DEFE 3-record has a unique ID (e.g. BT 5569) and a reference to one or more HW5 records used to compile the DEFE 3. The example shows how information filters down from HW5 raw data to DEFE 3 data and is summarized (and condensed). Also, HW5 data that was not deemed “important” enough to be included in summaries might not have been transferred into a DEFE 3 record at all. Understanding this relationship between the levels of ULTRA information allows to judge the type of information shown for the rest of this post. A much more elaborate discussion on the material and how it is related, how it can be obtained, and how it can be read is provided by Nick Beale on his own website. In my original draft of this post, I was using screen shots of the original DEFE 3 Records retrieved from the National Archives. I have then decided to replace them with “reproductions mimicking the general layout and appearance” of the data. These reproductions have been altered in content by omitting certain information (e.g. the header), replacing the “literal” representation of numbers with actual numbers (e.g. THREE is represented as 3) and removing the duplications used to emphasize words which are now displayed in bold characters (e.g. “WELTER £ WELTER” has been replaced by WELTER). The qualify of the material is poor – the original information is hard to read as the letters have been really “washed out” in the reproduction. It is readable but it is nicer to have a clear print. I am not sure about the actual copyright – the material is available “for free” but that does not necessarily mean that the National Archives would be too thrilled about someone just “re-using” their material (I pulled their electronic records, I did not photograph them myself). All in all, I hope you can live with the limitations – if you want, you can always pull the original records at no cost. It is said that the ULTRA data (HW5) only holds a handful or two of records in relation to 10./NJG 11 – or “Detachment Welter” as the British referred to it. And only a part of this information has been filtered down and is included in DEFE 3 records. 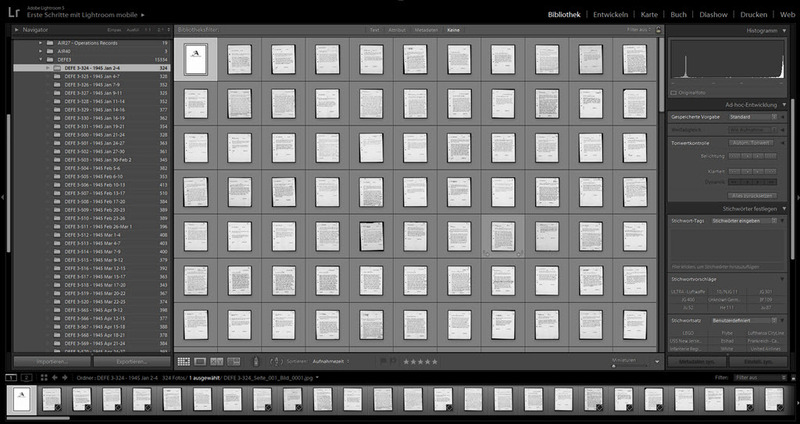 What you see above is a part of my “Image Database”, built with Adobe Lightroom. What I am trying to achieve is to get all my data into a homogeneous format (JPG in my case) and manage them in one central location. It is just to give you a taste but on the image strip at the bottom, you can notice some page previews with little black boxes in the lower right corner – these are the ones that I have already indexed with some keywords so I can easily find them later. As I already said: the graphical quality of the DEFE 3 records is poor – and although they all have been typed in their time, they are hardly readable these days – especially not for an OCR software. Still, I did process them to come up with some initial data quickly (not relieving me from digging the details at a later point in time. “Strength return from Detachment Welter to Night Fighter Department of unspecified authority. Aircraft 23 and 15, namely 15 and 10 G-6, 3 and 2 G-10, 5 and 3 G-14. Crews 17 and 14. The first part, I think, is incorrectly related to “Kommando Welter” – it refers to the strengths of two Staffeln, possibly of II./NJG 11 (which is not “Kommando Welter”). They report their respective strength on Messerschmitt Bf 109 G-6, G-10, and G-14 together with their crews – 17 and 15. The second part – reported February 10, 1945 – very well refers to “Kommando Welter” – reporting three aircraft (Messerschmitt Me 262) ready for combat. The comment added by the intelligence people located the unit at Rechlin-Lärz in December 1944 and Burg near Magdeburg in February 1945. OCR only took me so far – at the end, nobody saves you from going into the data directly but with the OCR picking up bits and pieces, you also get the references to other messages and that helps tremendously. The next occurrence of ULTRA material referring to 10./NJG 11 is located in DEFE 3/510, the material compiled between February 23 and February 26, 1945. The reference is BT 5569. 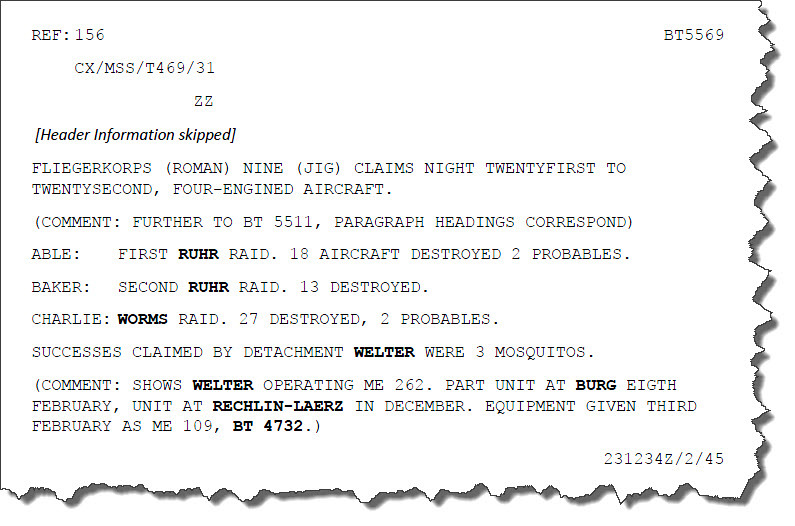 This one is a summary of operations covering the night of February 21/22, 1945. 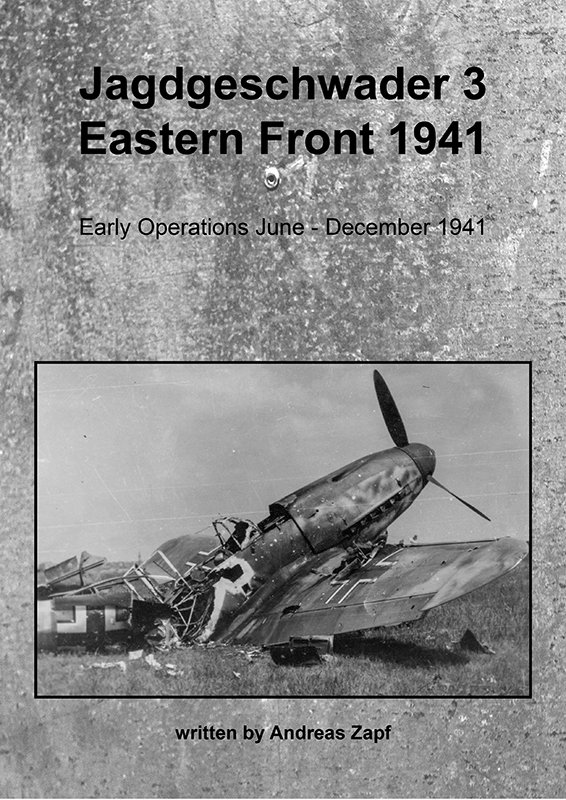 It amends a second report, BT 5511, and provides some details on the attacks of the night – specifically the success claims of the Luftwaffe with “Kommando Welter” in particular. The part interesting in relation to 10./NJG 11 is the lower part: it seems like this is the first time the British notice that 10./NJG 11 (aka “Kommando Welter”) is equipped with Messerschmitt Me 262 – the earlier report referenced here incorrectly assumed Messerschmitt Bf 109 from the included report on strength that most likely was for the remaining Staffeln of II./NJG 11 (which 10./NJG 11 is associated with). 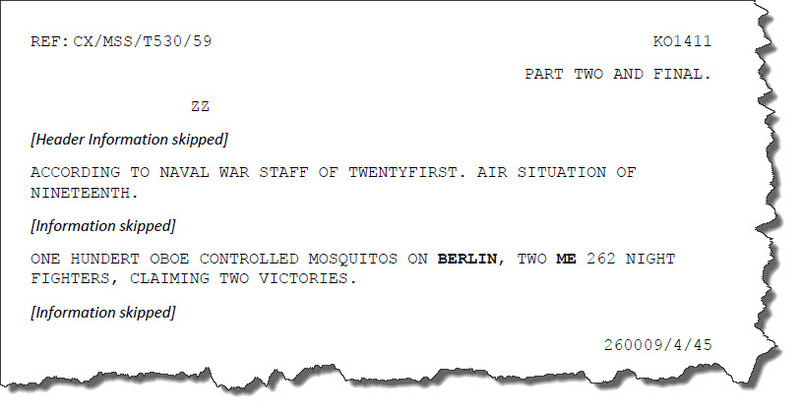 In essence, this is the same content than the previous one – a bit more precise in the sense that the Mosquitos are specified to have been raiding Berlin – but also adding the same comment on previous locations at Rechlin-Lärz and Burg near Magdeburg. Those two reports, BT 5569 and BT 5568 are providing identical information. 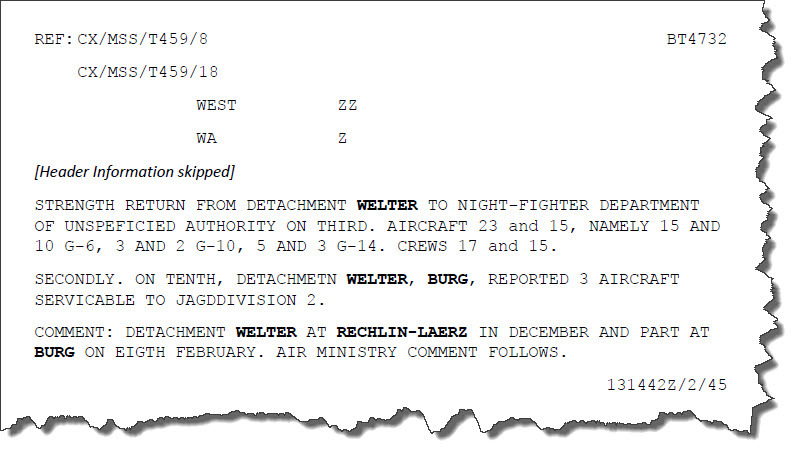 The already mentioned record BT 5511 is a rare find: an intercepted report by Fliegerkorps IX Ic on the night operations of February 21/22 – transmitted at 0100 February 23, 1945. 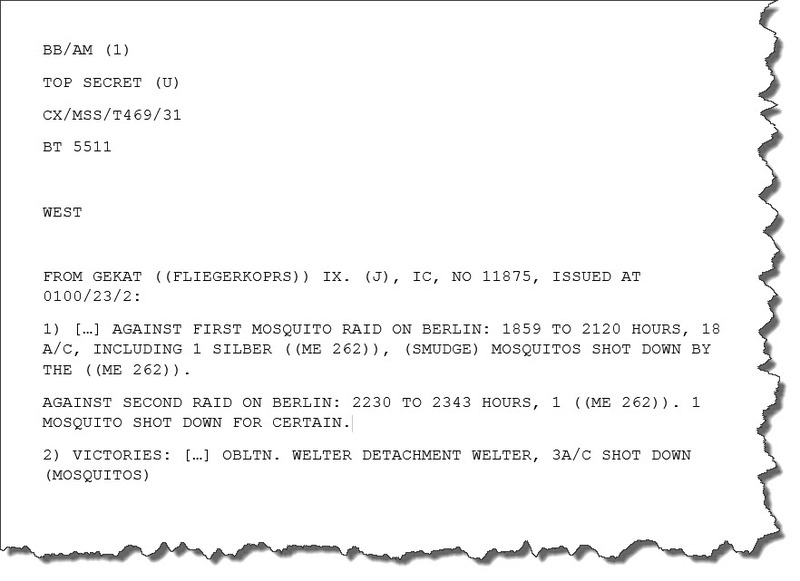 This intercept adds an indication that “someone” of 10./NJG 11 claimed three Mosquitos in one night. Given that there was only one Me 262 up in the air, the pilot claiming should be Kurt Welter himself. 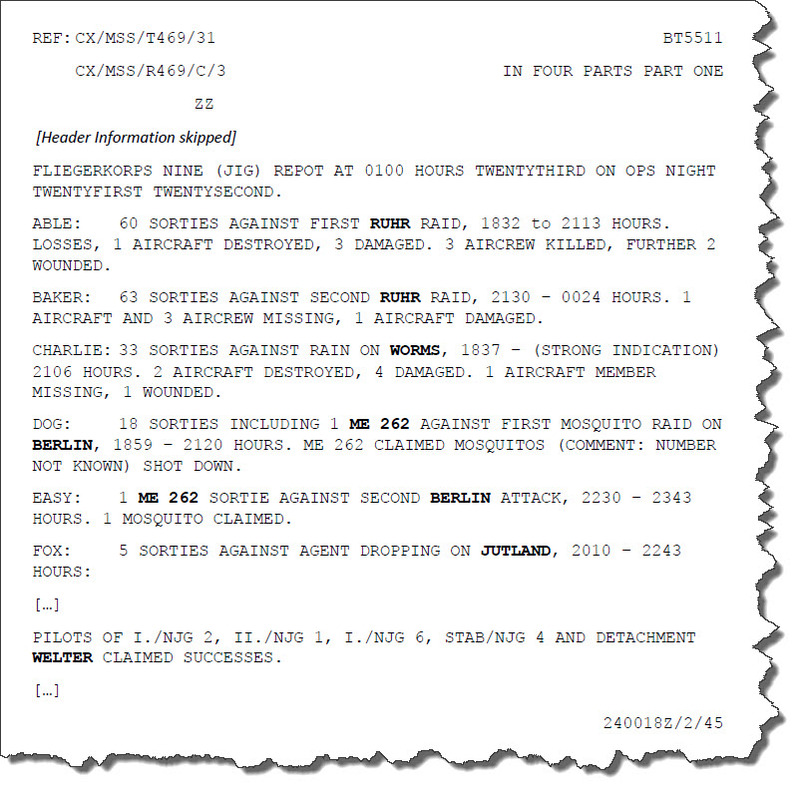 In this case, a closer look at the underlying HW5 Record only suggests a proof of this at first glance – but given that other units are also referred to including the name of their commanding officer, this merely shows that the British very well knew who was in command – and not that the named pilots necessarily scored that particular night. To complete the picture: the Royal Air Force it not missing a single Mosquito from the Berlin raids that night – all the “Mossies” return to their home airfields safely. Strange enough, non of the crews is noting any sort of attack – despite the weather being clear and they did mention being perfectly able to see the target in the bright moon. To my current knowledge, only two Mosquitos are assessed with damage attributed to flak – both belonging to the No. 608 Sqn. Of lesser importance is the intercept of a personal matter: BT 6121 records the transfer of an officer from III./NJG 3 to II./NJG 11 – it adds “Detachment Welter” but if that was part of the intercepted message or an assumption by the intelligence people is unknown. Date of this transfer was possibly February 12, 1945. Sent out in early March, possibly March 3rd, 1945, it details “ME 262 Strength of 10./NJG 11 according to 2. JD on 3rd: Total 6 of which 2 to strength. Serviceable: 2″. Given that the message was intercepted coming from 2. Jagddivision, it is totally possible that it has been reported earlier – however, the strength of the unit at the beginning of March 1945 is 6 Messerschmitt Me 262 of which 2 are serviceable. The next DEFE 3 Report dealing with 10./NJG 11 is KO 877 – at least the next one I was able to find. This transmission, dating April 18, 1945, indicates 10./NJG 11 now being located at the highway strip near Reinfeld, just to the south-southwest of Lübeck. This highway strip is their interim base and dispersal area as Lübeck-Blankensee is extremely packed and also subject to frequent attacks by RAF Night Fighters flying intruder missions over the remaining unoccupied Germany. This transmission verifies the arrival of Welter’s unit in Lübeck on or before April 18, 1945 after they had to vacate the bombed airfield at Burg near Magdeburg. A final DEFE 3 Report, KO 1411, is dated April 26, 1945, dealing with an intercepted naval report describing the air situation of April 19th, 1945. The part of the intercept shown above deals with one of the final Mosquito Raids on Berlin – and two of 10./NJG 11’s Me 262 in pursuit of the “Mossies”, claiming two of them shot down. CX/MSS/R400/C/22: dated December 1944 (possibly December 13) and requests experienced radio operators for an assignment to “Detachment Welter”. CX/MSS/R456/C/26: dated February 8, 1945, containing some snippets about the availability of men from “Kommando Welter” to service a Signals Station at Burg and a request for starting time (probably take-off time). CX/MSS/R458/C/9: on February 11, 1945, various snippets about availability of personell and wireless transmission equipment. CX/MSS/R475/A/27: on February 28, 1945, a reference to an “Ahorn” (code name for Me 262) with Oblt. Welter and Fu.G. 16 ZY and Fu.G. 25A. CX/MSS/R506/C/27: dated March 18, 1945, a missing report on Me 262 A1 110 652 with Obfw. Weibl (misspelled) and a reference to his flight route: Burg – Brandenburg – Magdeburg – Halberstadt – Stendal – Halle. Missing March 3, 1945. CX/MSS/R529/A/11: summarizes a transfer of personal from NJG 5 (name not readable) and 4./NJG 11 to 10./NJG 11. The names given for the latter transfer are Ofw. Schmitdtchen, Lt. Cypionka, and Uffz. Happel. Date given is April 10, 1945. I know there are some more that cover the topic but I have yet to see their content. However, I think for the purpose of this post, the assembled material is sufficient to support the conclusions. At the end of the day, the ULTRA records do not reveal anything surprisingly new – but they confirm certain aspects of the story and first and foremost confirm that the Royal Air Force and the Allied Forces were well aware of a night-fighter unit taking jets up into the nightly sky of Germany. They are am important primary source to exploit and should definitely be regarded by anyone interested in first-hand information on the topic. As mentioned before, DEFE 3 Records are available with the National Archives electronically and at no cost (which is why I used them here for illustration). The related HW 5 raw data is not available electronically so one either has to go to the UK and search the files directly or employ a researcher that does that. 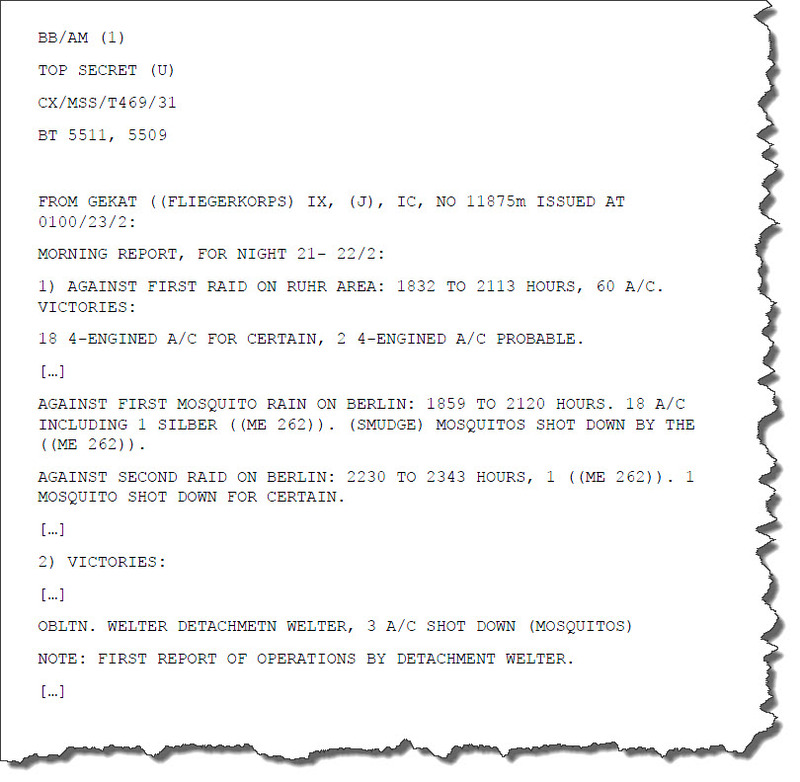 The HW 5 Records are more rewarding and present the original content of the intercepted messages – the DEFE 3 are good to get a general overview of the summarized information. Once more, support was received from many sides, a particular “Thank you!” goes to Rod Mackenzie for helping with the HW5 Data – most of this information has been kindly provided by him (which allowed to me to quickly find the corresponding DEFE 3-Records). Also, Andrew Arthy jumped in to help me – with material, with interpretation, with hints on where else to look. The second “Thank you!” to “Down Under”! If you get a chance, stop by at his web site – especially the blog entries there are quite an interesting read.